The original price is £265 and is now £130. With the extra 20% off, it is £104. You can find it here. It is an absolute bargain considering how well it is made and the lovely material used. It almost feels like soft suede because of the brushed Italian cotton. Design wise, it definitely has a subtle military influence with the placement of horn buttons, a double-breasted style and contrast piping trim. It looks stunning button up fully, partially or fully open. 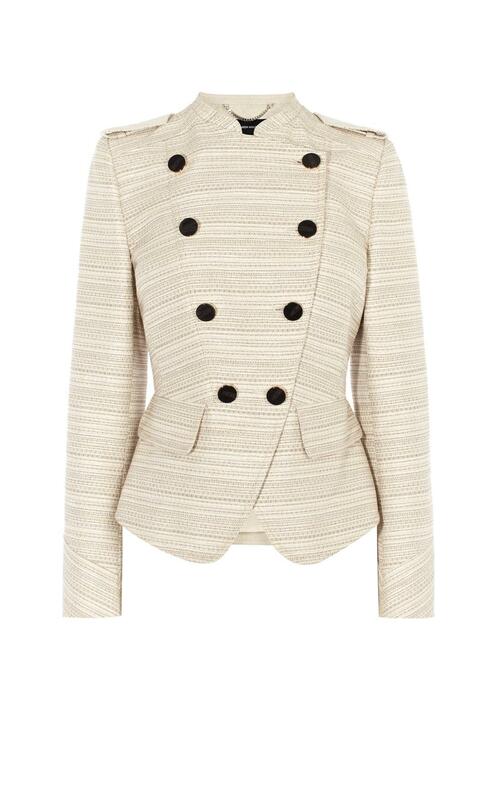 Whilst I normally wear a size UK 10 in Karen Millen for skirts and dresses, I had to purchase this coat in a size UK 12. The original price is £210 and is now £99. With the extra 20% off, it is £79.20. You can find it here. Again this is a great price given the quality of the item and how look it goods. Again the military influences is apparent with the double-breasted style and contrast piping trim. The buttons can be done all the way up (see the picture above) or partially (see the picture below). The original price is £199 and is now £75. You can find it here. The buttons can be done all the way up (see the picture above) or partially (see the picture below). The original price is £350 and is now £140. With the extra 20% off, it is £112. You can find it here. Crafted from luxurious Italian cloth, this is your investment coat for winter. The luxurious fur collar can be detach for a more casual look.